Hello Gina – Thank you for taking part in this interview for Natsreadingcloud. Would you like to start by introducing yourself to my readers..? Thank you Nat for having me on your lovely cloud. *Sits down on a fluffy white spot and passes a round of apple pie for your readers to enjoy* Unlike my character Lauren, I do enjoy baking and in a real life quandary of “is life imitating fiction or is fiction imitating life”, I’m excited to announce that I’ll be competing in a pie contest this July 2nd. This will be the first baking contest I’ve ever entered and there are only 20 other entries, so the odds are not too bad. I can’t say I’m not nervous, but it will be an adventure to say the least. Can you tell us a bit about How to Bake the Perfect Apple Pie? 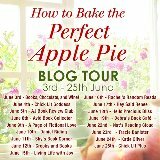 How to Bake the Perfect Apple Pie is a standalone book, however is the third book in my Home for the Holiday Series. Each book features Lauren Hauser and her growing romantic relationship with Jack Walker. In this book, Lauren is returning from the holidays to a new promotion and a new ring. As in a diamond on her finger. She has to navigate between the role of being a manager and being a fiancé, and on the side she tries to plan her wedding. Readers get to see how she tries to balance both roles and the curveballs that are thrown her way all the while trying to create her own spin on her grandmother’s apple pie recipe as she gears up to compete in the annual fourth of July pie baking contest in her home town. What kind of research did you do for How to Bake the Perfect Apple Pie? I am imagining lots of apple pies hahahaha!!! Haha! Indeed…lots of sampling was definitely in order. I did research lots of different apples to find out what truly make the perfect apple pie. Readers will find out in the story about why choosing the right apple is so important. With each book…I research the setting there is a romantic moment in How to Bake the Perfect Apple Pie and I scrolled through lots of photos of a certain area to really envision Lauren in Jack in this special spot. I have a Pinterest board for each of my books and a Spotify Playlist as well. Do you have a favourite book you have written? Oh now, that’s like picking a favorite child…haha! However, I’ve always considered the first book I wrote to be my magnum opus, yet, it remains unpublished. And it needs quite a bit of editing before it can be submitted for the possibility of publishing. In alphabetical order my favorite go-to can’t wait to read their next books are: Karen Aldous, Mary Kay Andrews, Mandy Baggot, Tracie Banister, Ana Blaze, Claire Cook, Geralyn Corcillo, Helen Fielding, John Green, Liane Moriarty, Kate Morton, Engy Albasel Neville, Angel Nicholas, Raven McAllen, Katie Oliver, Chris Pavone, Rebecca Raisin, Helen Rena, Rainbow Rowell, Ruth Saberton, Amelia Thorne, Samantha Tonge, and Molly Ann Wishlade. I love reading across genres but usually stick with some form of romance. Living in an imaginary world. Ha! I’d say one of the most gratifying things about being a writer is hearing from a reader that really enjoyed your book. I understand one of your favourite past times is running? Do you have any top tips for this? I do love running. I began running on my Cross-Country team in Germany and it was the best running experience of my life. The backdrop of Germany’s gorgeous landscapes and with such a nice climate, it was really perfect. Definitely better than the hot summers of Texas. I remember when I returned to the States and thought I could just jump out and go for a regular jog mid-day in July. I was not accumulated to the heat of Texas and was very close to having a heat stroke. For me, I have to have a really great playlist to keep me motivated to continue running. The other thing I would say is that if you are just starting out the Couch to 5k app is really great for getting you geared up to running longer distances. A scrumptious pie. A long distance guy. 4th of July fireworks guaranteed. Lauren Hauser has it all…nearly. With a shiny new job and sparkly new engagement ring on her finger, the only thing she’s missing is her gorgeous new fiancé by her side. Should she be worried? Jack’s kisses are as sizzling as always and, sure, long distance is hard but, she and Jack are solid, right? Of course the stress of planning a wedding—or not—is nothing compared to the stress of baking an apple pie. Because it’s not just any apple pie that Lauren must bake for the 4th of July contest; it’s her grandmother’s famous, award-winning apple pie! Yet Lauren is determined to make this pie her own and a little apple pie should be no problem for the Hauser clan dessert queen…! But with her new job taking up so much time, a prize pie to perfect and the growing distance between her and Jack, Lauren begins to wonder if she can really have it all… Only one things for sure, there’ll be fireworks this 4th of July! Gina Henning currently resides where bluebonnets line the highways in the spring, but she prefers the rock flower anemone from under the sea. Above the ocean’s surface Gina likes to dance with her three boys and travel to exotic places like the grocery store with her husband. Her pooch Schatzi is a mix between German Shepherd and possibly pig. One of Gina’s favorite pastimes is running. She recently completed her one-and-done marathon. At the end of the day her glass of wine is always half-full.